When it comes to Christmas, I am a fan of woodland themes. I buy all kinds of deer ornaments every year, though there is nowhere to put them all - I may also be guilty of buying a 45cm glittery jackalope from Paperchase when it was on sale in last year's new year sale...and it hasn't yet left its box. It's lurking in the spare room and I'm desperate to find somewhere to park the thing this year! Anyway, the love for woodland themes also lends itself to all of the dark, forest green and deep reds, with snowy bark thrown into the mix, and, of course, pinecones. 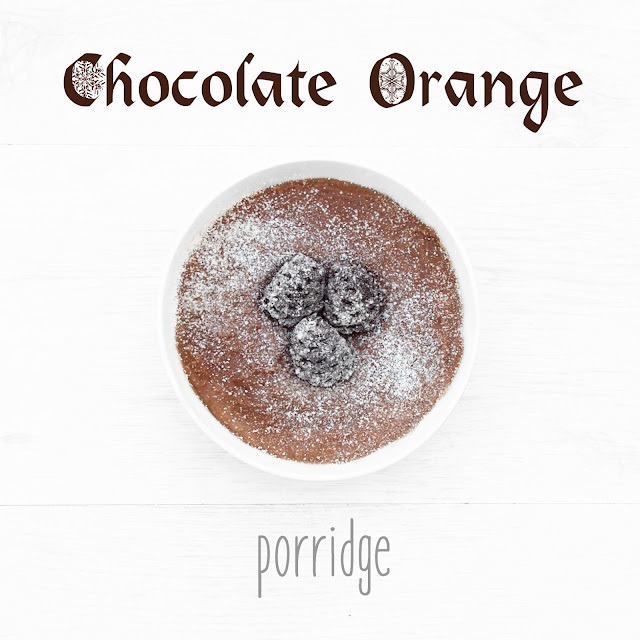 Which leads me rather clumsily into today's porridge recipe: Christmas chocolate orange porridge with protein pinecones and chestnut flour! 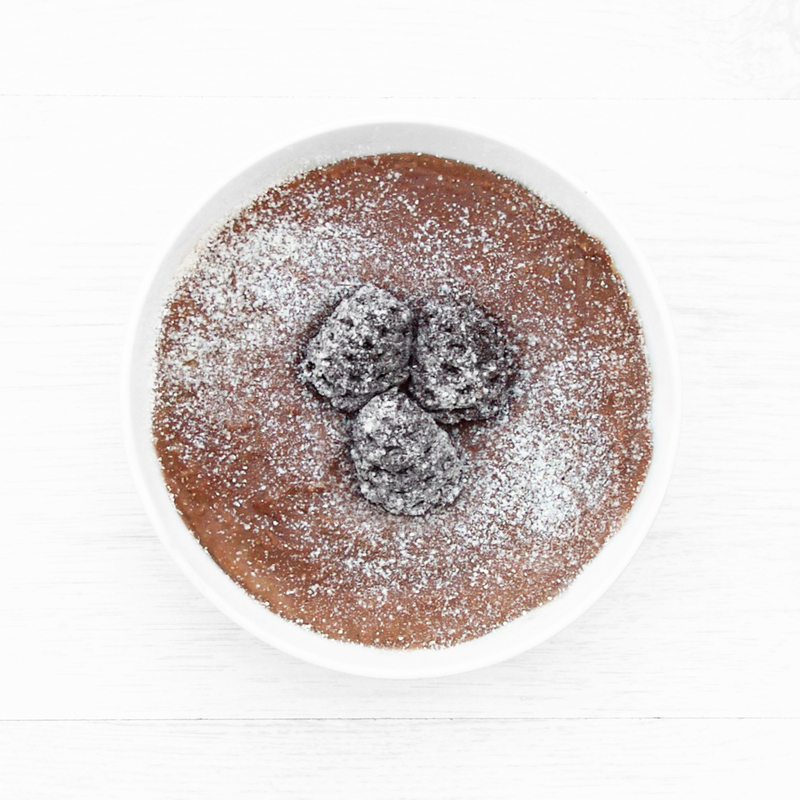 Chestnut flour is a great alternative to icing sugar or powdered sugar for that snowy Christmassy effect. Chestnuts are sweeter than other nuts, and low in fat, but unlike sugar, it's not too sweet, making it perfect for breakfast time, and can be used in place of any decorative powdered sugar on cakes, cookies or any other foods you want to give the snowy treatment to. It's not as easy to find as powdered sugar, of course, but larger supermarkets will stock it and, failing that, websites like RealFoods or Dolphin Fitness sell pouches without high shipping - but what you gain from cheap shipping, you lose in shipment time. It could take about a week to receive it, perhaps longer over the Christmas period, so keep that in mind! See chestnut flour in my German Christmas fig porridge. I also used Bounce mini bites for the pine cones. I think they look great! They take a little bit of kneading, but it works. Take 3 mini Bounce balls or similar, and soften them into a longer, finer shape. Stick a skewer into the bottom and push in about half way. Hold the skewer at the point right beneath the ball, so your fingers are resting right against the bottom of the ball and stop it from being pushed down the skewer any further. Take a sharp, tapered knife and, beginning at the bottom, drive the tip in a short way at a downwards angle, then lever the blade downwards so the blade is horizontal. This should open up the cut. Work around the bottom and then start moving up until you get to the top. The shape will grow shorter and fatter at the bottom with the downward force on each layer to make a more pinecone shape. The lower cuts will also close as you work your way up, but that's fine. Once you've reached the top, go back to the bottom and open the squashed ones back up with the same method. This should take about 10-15 minutes for all three. 1. Combine oats, whey, cacao, cinnamon and cloves in a bowl (or shaker bottle) and, stirring all the while, add the milk (or shake to combine then pour into a bowl). Set in the fridge overnight. 2. Add 50ml water and heat the following morning either on the hob or in the microwave - 1 min, stir, then 30 second bursts until desired consistency. Add the orange juice, stir it through, microwave again if desired. Arrange your pine cones, then dust with chestnut flour and serve. 2. Combine oats, whey, cacao, cinnamon and cloves in a pan and, stirring all the while, add the milk, then 100ml the boiled water. Bring to a boil over medium heat, stirring to prevent burning, then reduce to a simmer for approximately 15 minutes or until desired consistency. Add more water if need be. 3. Add orange juice in the final minute or so and stir through. 4. Transfer to a bowl. Arrange your pine cones, dust with chestnut flour and serve. • I used mini bounce bites, but you could use any mini protein balls, or make your own! • I measured out 5g of chestnut flour, and used probably only about 1-2g. Nutritional table is for the full 5g.